This week, after a few more calls with startups that are turning into wannabe ICO issuers and most of all after seeing yet another major VC-backed company planning an ICO, I started questioning the intentions and goals of the VCs and investors that are pushing their portfolio companies to raise capital with token sales. I think we are reaching the limit of the first wave of ICOs, with a constant stream of absolutely bonkers proposals bordering on scams. I hear your questions: "if you're so critical of ICOs, why are you even writing this newsletter and caring about this market?" My interest lies in the technological revolution rather than in the bypassing of venture capital and other traditional funding mechanisms. Bitcoin and Ethereum have been the two biggest technological and economic revolutions I've witnessed in my life, and they'll be hard to beat in the future. When I think we now have almost fully-featured trustless, censorship-resistant economic and computing networks, I still get giddy. It's amazing. But while I think democratization of access to capital is amazing, I also think we're not at that stage at the moment, and we won't be for a while, not until we're able to move a lot of the economic activity to the blockchain and until we'll coordinate entrepreneurial endeavors with Aragon or similar structures. What we're witnessing now is just a complete cash grab from people that are devising tokens just to justify raising cash from absolutely uninformed market participants. In my town, asking money from people in exchange for something you think is worth 0 is squarely on the other side of the "OK" line. If I see a desperate startup do that just to survive, I just recognize it and instantly pass. BUT, when I suspect that some VCs are actively suggesting to their companies to think about token sales, then I start to worry. And I really worry for them, but most of all for all of the venture ecosystem. As usual when something wanders through my neural paths, I posted it to twitter, but this time I'd really like to explore the topic a bit more in depth, as well as solicit the feedback and ideas of both crypto and VC people. My current view is that the game that ICO-pushing VCs are playing is all risk and very little reward, which doesn't make it a great one. - Let's assume we have a non-performing company in our portfolio with a large user base. This is maybe a company that has failed to find a way to monetize, or doesn't have enough growth metrics to attract the next VC round, or just plainly hasn't found PMF yet. - Let's also assume we are well aware of the ICO trend, and are capable of providing a strong signal to the wider market, bumping up the chances of said company to raise substantial funding in a public token sale. What do we do? And why? do we, as investors, actually believe that an application-specific token with no cryptographic reason of existence would generate and retain value both for the company and the token holders? If we do believe that, then it's all good. We don't care about the equity anymore, are happy to relinquish governance to a foundation maybe, and will just hold the token for the long term until the company has developed its ecosystem and has been able to align the value exchanged on the network to the token. But I have a hard time thinking that some of the smartest minds in the world believe that introducing more friction in an ecosystem, with no underlying "platform protocol" which would need a token, would result in any more value (especially at the valuations for tokens that are flying around). - So, let's now also assume that we don't really believe the token should exist or would improve the chances of success for the company. Do we condone / suggest an ICO? Do we advise against one? It's a VERY tricky question. After a bit of thinking, my bottom line is that there is no real positive outcome in a situation like this for the VC firm. Let's assume the positive scenario where there is a successful token sale, and the company raises $100M. The company gets some nice new runway, but even if it's then able to find its real path, it would have trouble to get acquired. Who would ever in their right mind acquire a company that sold hundreds of millions of dollars of securities around the world to god knows who? That would not pass one single due diligence meeting with any reasonable acquirer. Same goes for a public market listing. So the equity of the company, even if it might not have been worth much earlier, is now worth probably even less. Obviously if the company raises the money and then fails to achieve anything, we'd now have thousands of pissed "investors" all over the world. In both cases, the VC doesn't really come out of it too well, and I think could go down in flames like some firms that were financing pre-bubble internet firms. Because, now, instead of being remembered as the VC who backed that startup that failed, we'll be remembered as the VC who backed a startup that failed and also sold extremely high risk securities to users all around the world for a lot of money. "If they were to incorporate a token for a novel use case, and sell a small amount, at a fair valuation. And if they didn't use that funds to pay back investors, I would be excited to see adoption by a large app. But this isn't adoption. This is a bailout." And, FWIW, this is the feeling with almost everyone I consider smart and informed in the crypto community. 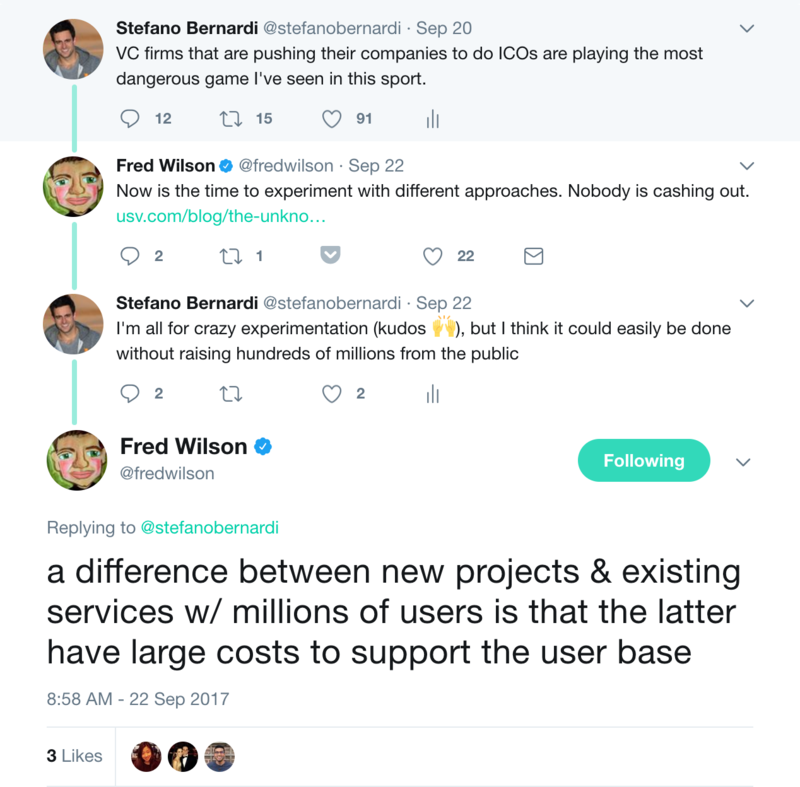 To my surprise, I got an answer to the previously linked tweet, from none other than Fred Wilson himself. But the answer wasn't really too convincing this time around. Fred answered linking to a blog post from Albert Wenger (another of my favorite people) where he basically argues that we should encourage different ways of pursuing a path to a decentralized future. Some will do it with ICOs for new protocols and some will do it with ICOs for current networks. My view is that we can accelerate towards a decentralized future without VCs offloading their venture risk to the public. Companies with existing user bases should absolutely experiment (because let's remember that here no one has a clue what they're doing, we're all just experimenting) with tokens, but they can very effectively and much more safely do that without having people buy them. They can just give them out to incentivize specific actions or assign monetary value to specific and previously un-valued transactions of any sort. I think it's dishonest to not address this point and carry on like ICOs are a must if you want to introduce a token. They aren't. And Fred very well knows this. His only argument on this is that these companies have heavy burns because of their large audiences. Was really surprised to get this type of answer from someone like Fred. Might start believing they actually think that it's ok because they have a lot of costs. In a chat with Joe Urgo of district0x he provided a very interesting completely alternative idea to mine, saying that this is the only right behavior. "Like he says in his follow up tweet, necessity is the mother of invention. Like we were talking about the other day, these companies are dead in the water as is, so they need to try something. I don't know that I could call what they are doing dangerous at all, they are being prudent, they are advising their dying investments to take a hail mary and at least try to make something work. If VC firms know this is a viable option at the moment (which they all should), then it could be argued that _not_ advising companies in similar boats to do the same is dangerous. It shows they are more worried about reputational blowbacks to them than in helping their companies succeed." For now, I'm still only writing checks for core cryptographic protocols whose usage is directly linked to the value of the token and still advising anyone which does not have a core need or use for a token to 1) not use one and 2) if they really must, then most definitely don't do an ICO but just introduce it gradually, test, learn and think about the future repercussions of their actions. An absolute gem from the #3 Bitcoin user, after Satoshi and Hal Finney. I don't think it deserves a tl;dr because you need to read this now. Another week, another major milestone for crypto. If you're tired of ICOs, this is the news you're looking for. Decred and Litecoin developers have successfully completed an Atomic Swap, according to a tweet from the Decred team. An atomic swap is basically a ShapeShift-like transaction that happens automatically, on-chain. Unfortunately there hasn't been too much disclosed on how it actually happened, so we will have to wait to see how it impacts projects like 0x and Kyber. The first thought here, is that atomic swaps will be better than using a DEX protocol or platform, BUT they won't have relayers and order books to organize liquidity. Another thing to add to the "super interesting to think about" stack. Very cool article by a former Mexico Central Bank portfolio manager, now an MBA candidate at Sloan, on how to apply portfolio optimization based on standard MPT to crypto portfolios. The author uses Enigma's Catalyst platform (a platform to run micro crypto funds using data shared on the Enigma network). In a follow up post to his excellent funding protocol development through inflation, Fred Ehrsam elaborates on the value of (hard) forks as an evolutionary mechanism for blockchains. Fred make strong argument for redistribution of tokens at forks (which rarely happens) to ensure incentives are fully aligned, by switching control of foundation-like tokens and diluting all token holders to make grants for the developers leading the fork. I'm not going to link to the actual BIP thread because it's too complicated, BUT I think this is interesting. There is a team that is working on a BIP called Dandelion which would add a privacy layer on top of Bitcoin transactions by removing the ability to find out the IP from the transactions. The solution is a sort of TOR for Bitcoin. This is interesting because many of the Bitcoin monitoring tools sold to governments and police around the world use this specific "feature" of the network to identify users. The race for privacy coins is on, and with Ethereum enabling zk-snarks and Monero's price rise + ZCash constant development, I don't really see a future for non-private-by-default coins. Byzantium, the first part of Ethereum’s Metropolis hardfork, is live on testnet and it was just used to verity a zk-snark transaction. Zooko also wrote about this from Zcash's side. So cool to see core technology advancements go this fast, in a sea of ICO scams. This is where the future is. Every day I grow more convinced that our generation's Steve Jobs will be Vitalik. "But whereas in bitcoin the protocol exists to maintain the currency, in ethereum, the viewpoint is much more that the currency exists to maintain the protocol." A great interview to read. I am VERY excited about Ethereum, given the amazing pace of development. If my VC investment days have taught me something, seeing a project with this sort of public interest + quality fast code shipping, it's not going to slow down any time soon. 25 minutes of Naval interviewing Vitalik. The title is a bit misleading, but Sam is apparently admitting to YC having done work to figure out its approach to ICOs. In the last YC batch there were only 2 blockchain companies, but that might change with the next one. Apparently the hacker just sent back around $3M worth of Ether they stole form Coindash / to Coindash. I don't have any mental energy or cycles to spend on this one, so just presenting it like it is. FINALLY. This is my #1 favorite feature of Coinbase, but was only available for Bitcoin until this new release. If you don't have a hardware wallet, this is what you should be using. Every time someone improves on the UX of crypto usage, it's awesome news. In this case, Trezor has released some tools to enable the recovery of most erroneous transactions (when you send coins from specific chains to wrong chains or badly formatted addresses). The UK Financial Conduct Authority (FCA) issued a brief statement warning consumers about the risks involved in ICOs, stating how some ICOs "fall outside the regulated space", some don't. Notable difference with US security law is that the UK does not have an equivalent to the Howey test. On that note, if you are into security law and can bear with Preston Byrne's marmot jokes, he's meticulously dissected the FCA announcement here from the perspective on an English lawyer. Of all the major regulators who have expressed views, the UK FCA appears to have taken the most light touch approach so far. "Ethereum's answer to bitcoin's Lightning Network will have one notable difference – a publicly traded token to be sold in a Dutch auction in October." This is a big disappointment for me, as I was really hoping that Raiden would launch without a token and bring Lightning-like capabilities to the Ethereum chain. Too hard to ignore the millions flying around obviously. I'll try to not trigger the spam filters here, article is SFW, site is not. We've spoken about this before, but hopefully peak ICO is almost around the corner. We wouldn't be surprised if some of these celebrities are going to end up being prosecuted for the promotion of unregistered securities, insider trading, bribes and so on, as they most likely are receiving both cash and tokens, which they have an incentive to help appreciate in value. The NYT interviews the creator of Dogecoin, which has been sounding the alarm for a while now. The Blackmoon Crypto platform touts itself as "a one-stop solution for asset managers to create and manage legally-compliant tokenized funds"
Roger Ver and a bunch of early Bitcoin millionaires (billionaires?) are planning to buy land and sovereignty over that land from a country. They have more than $100M, which they plan to offer to highly indebted countries to form a "new Monaco" of sorts. It needs to be in a safe zone and be accessible by water. I was enamored with the Seasteading Institute efforts, but I've also grown more interested and appreciative of the roles that nation states play in our lives. That being said, I'm all for experimentation in government and monetary policy, so I'm extremely excited by this! I'm also pretty sure that we might be looking at another ICO here.. but hopefully they'll just adopt Bitcoin as the national currency instead. BigchainDB, in partnership with Dex, unveiled the concept behind the Ocean Protocol, the natural evolution of their work on blockchain + AI. Ocean will be a protocol and network to facilitate data marketplaces. The protocol will have the role of figuring out who owns what and provide the linking infrastructure. Data marketplaces have been a pretty obvious idea since the beginning of blockchain and smart contract technologies, so it's exciting to see more people try to implement them. Ocean will probably go on to compete with the Enigma network from MIT's Media Lab. “Harvest” is a piece of tech-art commissioned by the Konstmuseet i Skövde museum that uses wind energy to power a computer, connected to the internet via satellite or 4G and geared with an Nvidia graphics card, to mine Zcash. The earnings will fund for climate-change research. The interesting aspect of this experiment is that crypto currency offers an alternative and decentralised way to 'store' energy without relying on a centralised grid and the fees typically incurred in transferring energy to it. Balanc3 — a ConsenSys formation — has been working in stealth for over a year to build out a blockchain-based accounting platform. Super cool. They take live blockchain transaction data and turn it into accounting style data. Sounds like the worst possible job to me, but really glad someone is doing it - I'm sure this will be massively useful to a number of projects in the future. "Bitcoin is not a currency but a mere instrument of speculation". "Bitcoin is sort of a tulip". They just don't know when to stop the broken record do they? This is just a gem to be added to the Bitcoin Obituaries, and I think we'll be watching this again and again in a few years. It's still fascinating how some people just. do. not. get. it. and feel confident in dismissing the whole asset class and tech movement. The regulatory and geopolitical wars (protocolitics as Yannick coined them) continue! The Russian Leningrad region wants to create an industrial park for cryptocurrency mining including bitcoin. They are promising cheap energy and some special conditions, to try and attract maybe even some of the Chinese operators. Blockswater, an algorithmic liquidity provider, has filed a market abuse report against Jamie Dimon for "spreading false and misleading information" about bitcoin with the Swedish Financial Supervisory Authority. They say Dimon violated Article 12 of the European Union's Market Abuse Regulation (MAR) by declaring that cryptocurrency bitcoin was "a fraud". They also say that JPM traded BTC derivatives in Stockholm, so they might actually have a real case. On the internet, everyone gets hacked. The play here is the global mass market adoption of crypto and the need for user friendly front ends for fiat to enter the ecosystem. Coinbase spins out crypto fund managers faster than it resolves support tickets. After Nick Tomaino (1Confirmation - full VC) and Olaf Carlson-Wee (Polychain - hybrid VC hedge fund), Linda, former product manager, and Jordan Clifford, software engineer, join forces in yet another crypto hedge fund endeavor, this time as a straight up hedge fund trading big-cap coins with a focus on privacy. Author of Blockchannel podcast and former head of growth at Purse and more recently decentralised-Quora Cent.co, Steven McKie is teaming up with three other partners with a new crypto fund endeavour. Focus will be on public crypto assets as well as ICO pre-sales, with no info yet on fund size and other other GPs. Steven is a true crypto-native so we very much look forward to finding out more about what he's been cooking up, we hope it's not just about muscling in on pre-sale discounts and buy & hold ETH/BTC! More info soon, we are promised.